I completely support the reasoning behind your move. I can't wait to chat with you all over there! So did our accounts get moved to reddit? Honestly this is better than whatever crappy code is currently running the backend. You'll have to make an account over there, we don't have the ability to migrate accounts to Reddit. 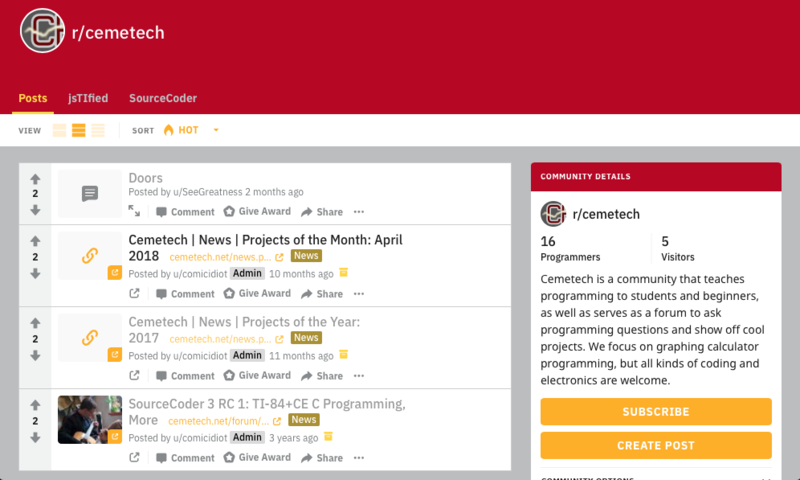 Please note that our beloved Cemetech.net will switch to an archive of forum posts as well as the host for your favorite tools such as jsTIfied or SourceCoder 3. We assure you the Cemetech Subreddit is very real and here to stay. It seems, from looking at the extensive member list on Discord, that a good number of us are already on-board with the changes, so I'm raring to go, and ready to try my quill in the new ink with which the future chapters of Cemetech will be written. Hooray, glad we could get some momentum to aid with the phasing-out of IRC that was discussed. We considered actually shuttering both IRC and Discord in favor of Reddit Chat but we didn't want to have that much change at once; so it'll likely be a 2020 or 2021 transition. We're one step closer to cheating our way into having a mobile app. Edit: Linked to the wrong reddit chat. We will definitely be switching to another technology for chat. As mentioned in our post Cemetech: 2020 and Beyond, Google Wave will be what we will end up using in the future. Our server isn't ready yet and, due to fluctuations in server availability (as Google Wave has become very popular), we are waiting on setting up that server. We are all looking forward to the switch to this next-generation messaging technology. Oh no... I dearly hope that this is an April Fool's joke. If this isnt, I really enjoy the forum format and it will be sad to see it go. To be fair, Reddit is basically a forum itself, would you not agree? Believe no "news" post that occurs on April 1st. I don't HATE the idea in any way, I just 1) don't really want to start over on reddit 2) don't want to make a reddit account and 3) will really miss the old site. © Copyright 2000-2019 Cemetech & Christopher Mitchell :: Page Execution Time: 0.133660 seconds.